2017 so far has been basically all non-fiction. I can deduce no reason for this so I'll just go along with it. 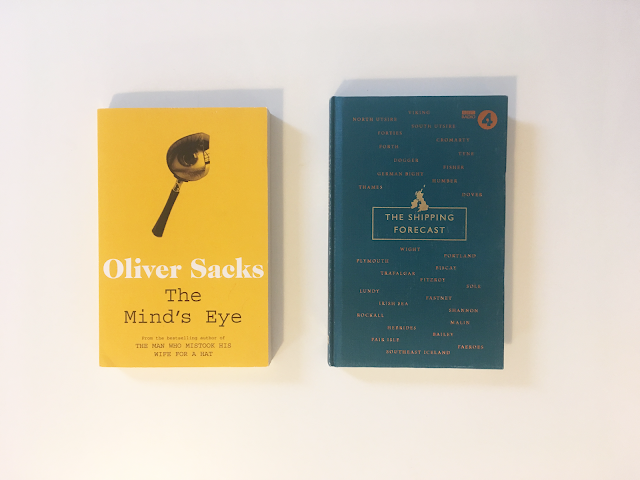 I picked up Oliver Sacks' The Mind's Eye midway through a first aid course I recently undertook as I think my brain suddenly decided that it was fascinated by the human body, in particular the peculiarities of the brain. This is one of Sacks' many, many popular science and psychology books, this one focusing in particular on our brain's relationship with the visual world. The first chapter is about a woman who suddenly cannot sight-read music as she could before, and letters on a page no longer create words for her. It's an interesting read, but I'm currently very distracted by Nic Compton's The Shipping Forecast. Yes, this is a book about the Shipping Forecast, one of my favourite things in the world. Can't sleep? Shipping Forecast. Want to pretend you're at the seaside? Shipping Forecast. This book outlines the history of the programme, its origins, and goes into detail on each area discussed. Never before have I concurrency wanted to passionately be a a sailor and not want to be a sailor. Steer clear of those 11s.